David Jones, ultra runner extraordinaire, sets the US record for fastest 100 miler in the over 65 age group, with his new resurfaced hip! Artur Akhmatkhuzin, gold medalist in the Rio 2016 Olympics, shares his story about hip resurfacing. Tomorrow is one year from my surgery, and I can not tell you how thankful I am to you every day -- you allowed me to have my life back, and I am sure many other people feel the same. Every day I do karate, grappling, wrestling and strength training, I teach seminars internationally every month, and I feel totally free and back to the level of performance of 10 years ago, I even think of competing in the karate world cup once more. You should be very proud of what you are doing, keep up the good work and I know you worked very hard to be one of the world's best in what you are doing. One more time, I cannot thank you enough. 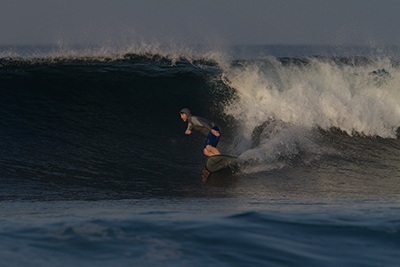 JL, 1 year after bilateral hip resurfacings, enjoying the surf in Costa Rica! 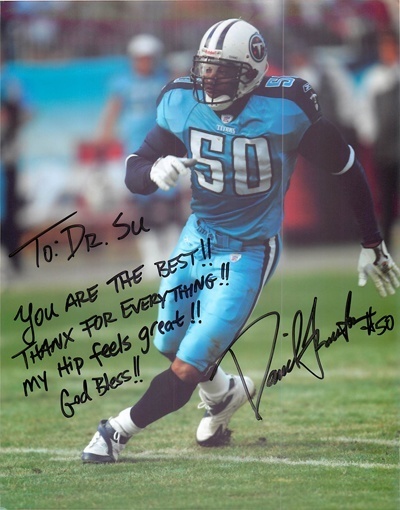 Congratulations to David Thornton, former outside linebacker for the Indianapolis Colts and Tennessee Titans, on his recovery from hip resurfacing surgery! Although he is not planning to return to the NFL, David now plays an integral role with the Colts organization as the Director of Player Development! Robyn Benincasa, adventure racer and founder of Project Athena, is really putting her new hip to the test. Her left hip was resurfaced by Dr. Su in 2009, and she resumed her duties as a firefighter shortly thereafter. Mike Sillinger, former assistant captain of the NY Islanders professional hockey team, underwent hip resurfacing surgery by Dr. Su. Mr. Sillinger has played in over 1000 NHL games for 12 different teams over 17 seasons! Shortly after additional surgery was required on his opposite hip, Mr. Sillinger decided to retire after an illustrious career. It was 7 months as of the 15th of June. (that I had my hip resurfacing with Dr. Su) I celebrated by doing the Mt Washington running race on Saturday the 16th. just a 7.6 mile jaunt up Mt Washington in New Hampshire with a 4650 ft ascent. Finished in 1:43:32 Good for 243 pl out of 900+ other crazies doing this. It was 13 minutes slower than my time in 1999 but I guess the mountain has gotten steeper in the last 8 years. I don't consider myself in the same categories as Corey or Floyd, so all of you out there wondering if there is a running life for mere mortals after getting your hip resurfaced I say "get out there and run". For my 1 year anniversary I am doing the NYC marathon next year. I might hang out with Jack Lalanne and pull a boat across the San Francisco bay with my teeth. It feels good when the pain is gone. Best wishes to all who have had this and those doing it in the future. Arizona resident Dr. Scott Clark loves to be outside. Whether it's climbing the world's highest peaks in the Himalayas, rock climbing in his home state, or scuba diving in foreign seas, he's in his element. So when his degenerative hip pain began to prevent him from lacing his boots before his climb, or even putting on his fins before a dive without his wife's help, he faced the facts. His hip, which had been deteriorating for nearly a decade, would require surgery. 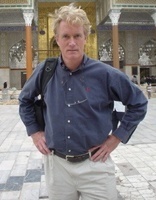 As an anesthesiologist, Dr. Clark knew how to seek the highest level of expertise and patient care for his procedure. He wanted to maintain his activity level while preserving as much of his joint as possible - after all, at 45, he was still young - and after the procedure was done, he wanted to recover as quickly as he could. With this criteria in mind, his search led him to Edwin P. Su, MD, one of the leading hip resurfacing surgeons in the country, who happens to practice at the top orthopedic hospital in the country: Hospital for Special Surgery. 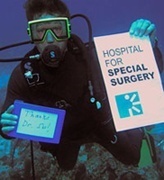 "I remember that one of his concerns was being well enough in his recovery to go on a scuba diving trip one month after surgery," says Dr. Su. "Having surgery was clearly a quality of life issue for him, and his candidacy for the hip resurfacing procedure really would allow him to maximize his potential." In the weeks and months before and after his surgery, says Dr. Clark, Dr. Su has been there for him whenever he's had a question or concern. "He's been very communicative, which can be rare in our day of medicine," he says. "I've experienced a variety of hospital settings. I had high expectations, and HSS truly surpassed them." After the procedure, he recovered extremely quickly, experienced no pain as soon as the surgery was finished, and was walking with help from a walker on the same day of surgery. He quickly advanced through all the physical therapy goals, and soon resumed his activities. On a recent scuba diving excursion to Turks and Caicos, Dr. Clark fit in several days of 7-8 mile walks on his newly resurfaced hip. "My recovery has been fantastic," he says. "I am now three months postoperative, and I feel as strong and as young as 10 years ago!" Having trained recently on a 9-mile, 3000 ft. climb in Tucson, he plans to return to high altitude climbing as soon as possible. When he does, he also intends to send us photos of himself hoisting the HSS banner on the world's highest peaks. Now that he has his life back, the sky's truly the limit. "After years of marathons, bike races, ski competitions, marathon cross ski races, big wall ice climbing, big wave surfing and even accumulating a little shrapnel in a handful of wars, both of my hips were completely shot. The x-rays showed pure bone on bone with enormous osteophytes. One prominent surgeon said, you have no choice. Your hips are too far gone you'll have to have THR. I thought for a moment. Boy if I'm confused as a physician and sports medicine expert, what chance on earth does the average patient have of making the right decision? One good answer is, because they are both excellent choices. Still there had to be a right decision. I began reading the entire world literature. I called doctors in France, England, Belgium, Germany. The more I read, the less I seemed to know. I reached out to Mr. Ronan Treacy, co inventor of the Birmingham hip and even the legendary Roger Banister's son. Both were incredibly thoughtful and helpful. Both said they'd have HR themselves. With the decision made, now I needed a surgeon. I offered to fly to Birmingham, England to have one of the inventors do the procedure. Graciously, they said, no need. You'll find a Dr. Edwin Su at the Hospital for Special Surgery in NY. He had their highest recommendation and that of every key player I could reach. HSS is considered number one in the US in Orthopedics. Their chief, Tom Sculco weighed in. "Ed is one of our very best." Wow. This was the surgeon my great friend and physiatrist VJ Vad had recommended six months before. I called Dr Su's office on a Friday morning. After 15 minutes of scrambling, his incredibly affective assistant Laura Janice had an OR date set for the following Thursday. I had spent the weekend in Aspen boosting my hemotacrit up to 48 so I wouldn't need a transfusion. On Monday I had a complete cardiac workup, x-rays and a visit with Dr. Su. He demonstrated that I had 30 degree hip contractures on both sides. Any questions he said? A Month before I would pummeled him with dozens. I just turned to him and said. "You're the best there is. I just want a near perfect biomechanical result. You're a great surgeon and I trust you. " The die was cast. I skied right through my last day before surgery, flew to Washington for a meeting on a young cancer victim in Iraq we were efforting treatment for and arrived in NYC at 1 AM on the day of surgery. I worked out for two hours at the gym, then reported to the hospital. At 1:30 PM Dr, Su appeared. "I'm psyched," I said. "So am I'" said Dr. Su. I was wheeled down a long corridor that looked more like a star wars bionics laboratory than OR. Less than four hours later I was in recovery, on my computer and making a conference call. The following day I walked to the nurses station and back with crutches. Dr. Su came to visit each morning with a ready smile and encouraging manner. His bedside manner got a solid A plus as did the remarkable team at HSS. I was sad to leave! By day ten, I had walked a mile on crutches, by day twelve, three miles. Now that I'm two weeks out I'm beginning to let myself dream of all things I'll be able to do again that I've put on hold for so long.a much better pop for surfing, more precise racing turns in skiing, running, rock climbing, even the Ironman. I wondered why I had waited so long. The answer was simple - Most orthopods say.you'll know when you're ready. The truth is I had been ready for years. While Americans emphasize pain as the main reason for surgery, I have a very high threshold, did tons of yoga and never had terrible pain. The British emphasize functional criterion. I had a terrible limp, striking waddling gait abnormalities, an abductor lurch and large hip contractures. As my fourteen year old son said before surgery, "Dad, you look old, really old." If I had one piece of advice it would be, get a great functional exam and use that to decide rather than pain alone. Curiously, all my pain was in my knees. My hips had thrown my biomechanics off so badly, that I was at risk of slowly destroying my knees. Well. I think I've turned back the clock, gained 1.5 inches of height, regained my proper posture and discovered a miracle that Pat has been a champion of for so long.